Austin is the capitol of Texas and home to the largest university in the nation, University of Texas. With a population of just under one million, Austin is a city filled with culture, attractions, and outdoor fun. Located in the Texas hill country and by three major lakes, there is so much to do in this beautiful city. Town Lake Park boasts 17 ball fields for baseball, football, soccer and rugby, and volleyball. The area on the south side of Town Lake from Lamar Boulevard east to South First Street is known as Auditorium Shores, and many concerts and large events are held there. East of IH 35 favorite spots for large Town Lake gatherings are Fiesta Gardens and Festival Beach, which stretches from IH-35 east to Canadian Street. All along Town Lake, people flock to the hike-and bike trails to walk, jog, bicycle, or otherwise enjoy the beauty of the Colorado River. Rowing Dock is a Town Lake Austin Parks and Recreation concession whose mission is to promote rowing and other family watersports. They offer rentals, camps, private lessons, classes and memberships. Lake Travis is 63.75 miles long, and its maximum width is 4.5 miles. The lake covers 18,929 acres. With it's crystal clear aquamarine water, Lake Travis naturally attracts water sport enthusiasts. From multi class sailboat and windsurfing regattas to competition ski boat, cruisers, cigarettes and mansion-like houseboats, Lake Travis maintains the marina facilities, public parks, boat ramp access and glorious hot summer weather making it a destination summer resort for outdoor enthusiasts from around the state and the country. The Colorado River is seen winding through the Hill Country from atop Mount Bonnell. It has always been the "hidden attraction" in Austin. 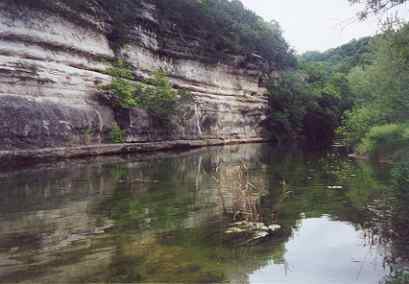 Over 700 feet above sea level, this natural limestone formation stands about 200 feet above the surrounding area. The top of Mount Bonnell provides a great view of the hill country. Mount Bonnell also offers a nice little hike up and around the "mountain." Directions: from downtown Austin take Loop 1 (Mopac) north to 35th Street then west to Mount Bonnell Road. Zilker Metropolitan Park is considered "Austin's most loved park." This 351 acre park is home to a variety of recreation opportunities and special events for the individual or the whole family. Enjoy a ride on the Zilker Zephyr miniature train or paddling a canoe on Town Lake. Play on the large multi-age playscape, hike and bike trails and large full-service picnic areas, 6 of which are reservable. For the swimmer, Zilker Park offers Barton Springs Pool, a natural spring-fed pool with a year-round average temperature of 68 degrees. The park is also home to the Zilker Botanical Gardens, which includes the Taniguchi Oriental Garden and the Austin Area Garden Center. sure to charm you with nostalgia and Austin's gorgeous city skyline; experience the exhilaration of the outdoors, the abundant waterfowl, and beauty that is Austin. Hop onto their narrated sightseeing cruise or witness the spectacular emergence of the famous Mexican free tail bats on their sunset cruise! Come see the sights and learn about Austin. Or jazz up your next occasion and have a private party aboard the Lone Star Riverboat. 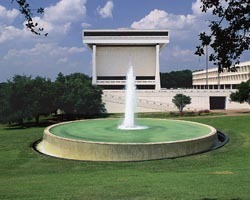 The LBJ Library in Austin, Texas is the repository of a large collection of documents, photographs, and audio recordings from Lyndon Johnson's Presidency. Of particular interest are memos and documents relating to planning for major escalation of the Vietnam War in 1964 and 1965, and also transcripts and audio recordings made while Johnson was President. 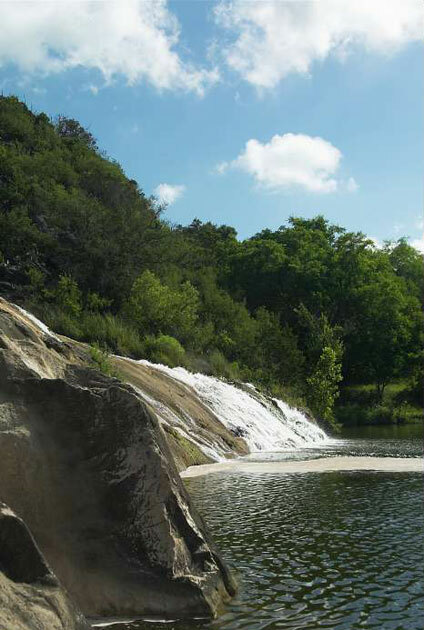 The Highland Lakes are located in the Hill Country of central Texas in Llano and Burnet Counties just 50 to 60 minutes Northwest of Austin and 85 minutes north of San Antonio. Lake Buchanan, Inks Lake, Lake LBJ and Lake Marble Falls and all of the towns around the Highland Lakes. Three of the four Highland Lakes are normally constant level lakes for ideal boating and other water activities. In the spring from the middle of March through most of June the Highland Lakes area turns into a virtual paradise with the fields of wildflowers. First, the Bluebonnets bloom, and they are quickly joined by the red Indian Paintbrush flowers for beautiful fields of red and blue. As these flowers start to fade the fields are taken over by other red, yellow and white flowers. Come out and watch these amazing creatures fly at night. Located under the Congress Ave. bridge in downtown Austin.